Hab jetzt das erste mal mehere songs von Dir konzentrierter gehört.Klasse gemacht Jörg!!! While listening to your album, I feel that I have been taken back in time. I feel that I am enjoying a sound track to a movie set in 1940's Europe. The sound of your instrument has a haunting calmness to it, this in my mind is a good thing. 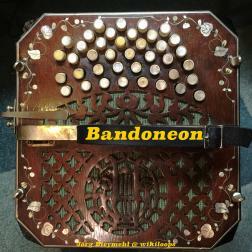 The selection of tracks you chose to play on are a perfect fit your the Bandoneon and your style of playing.Having such accomplished musicians by your side only adds to the overall beauty of the music. This is well done and I enjoyed the listen. Ich liebe die klaren Töne und das melancholische Spiel.